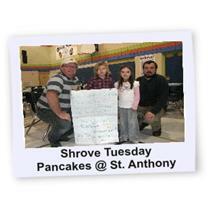 This year like many the Port Hope Knights of Columbus happily cooked Pancakes and provided juice for every kid that attends St. Anthony. Starting our day around 7am we set up the gym and started cooking, we cooked nearly 700 pancakes and served 350 students of St. Anthony and we look forward to doing it all over again next year! A warm thank you from the Kindergarden class at St. Anthony's for cooking pancakes for the entire School on Shrove Tuesday! B/R: Peter Edisbury, Peter Hills F/R: Frank Rodrigues, Reg Durocher, Frank McCafferty, David Bernier, Branden Fonovic, Stephen Egan.